There is 1 review for 'Dark Gate'. A fun job system... and that's about it. The job system is reminescent (as has been said in the forums) of FF5, although the sprites of the characters don’t change which is a big deal visually. But honestly, that’s the least of the problems of this game. For one, the movement speed in dungeons is outright sluggish, to the point where going through any dungeon is a chore. Then, the encounter rate is absolutely ridiculous, to the point where getting “Stealth” (a skill you get from a high tier class) to greatly reduce them is practically invaluable. I ended playing through the last dungeon with Stealth on and immediately using Ditch (instant escape) the minute I entered a fight, and that’s not a good thing. In the endings. Which is another swing and a miss, because the game clearly wants you to get the Special Ending. But to do so, you need to have two specific characters in your party. This is a very, very bad idea! Why would you put the True Ending behind having leveled two specific characters? I was lucky to have read the need to have them in your party and used them from the start. And even then, the Special Ending ends abruptly and doesn’t deliver much more in terms of story – just that the real Final Boss of the game is hidden behind that ending. And there’s the problem: It has multiple endings, with all the characters, but none really get you to that point. Why would you do that? All the characters’ endings should have been done as cutscenes in the real ending. The optional content is terrible, except for the quests (and the quests should not make you kill 50 of any enemy, eesh!). Four 100 floor dungeons appear at the end of the game, and the bosses at the end hint at something going on behind the scenes that you didn’t know about, but nothing comes of it. And the bosses are not challenging, they’re stat grinds. If you’re not strong enough, you can’t hurt them at all, and if you are, you can just mash your attacks until they die. Finally, the combat system, at least, is quite entertaining, it may not be for everyone but I found it really fun to alternate the autoattacks/item use with the skills, which use two different timers, and skills can be saved up to 3 simultaneous uses. I actually enjoyed this. So, all in all, I would love if in the future, Hit Point considered scrapping everything about this game except the class system and maybe the combat system and tried again – but this game in particular is a dud. Oh, and I hope they never again lock the hardest difficulty setting behind a paywall, even if it costs less than a dollar. 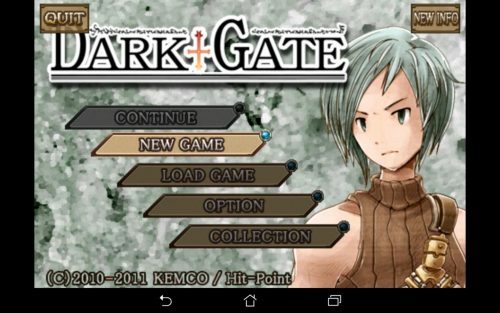 DarkGate is basically FF5 but with more jobs.